Over the past few months, I have spoken with several people who have run for office in Oklahoma, some successfully, others who fell short in their efforts. Either way, I respect anyone who has the courage to run for public office….for the right reasons. Running for office for “political gain” seems a bit trite to me, and in fact, with the current sorry state of affairs of our state’s legislature, running as a politician, or because you represent corporate interests, illustrates everything that is wrong with our state and our country. 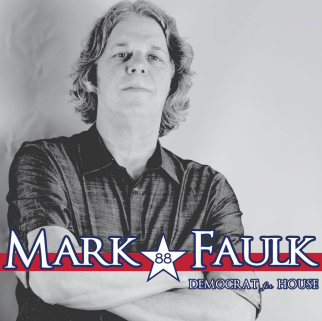 In House District 88, where I am currently a candidate for the Oklahoma State Legislature, we don’t put on airs, we don’t pretend to be what we are not, we don’t support the arts, or gay rights, stand up for the poor, or accept each others’ differences, simply because it’s fashionable or trendy. We do all those things because it’s the right thing to do. So when a politician runs for political office in The 88, and suddenly becomes a “passionate” advocate for the arts, I get a little suspicious. I AM an artist. I learned painting, art, ceramics, and sculpture at Classen High School in 1974 the heart of The 88, was a co-founder of the Paseo Festival in 1977, and spent years doing art shows, teaching ceramics and sculpture, and later, running a company that specialized in inlaid ceramic, marble, and inlaid stone murals for VERY rich people. I lived, breathed, and produced art with an obsession, and wrote music and short stories in my spare time. But somewhere along the line, my focus shifted to activism. Social and political issues had always played a part in my art and music. But in 2004, I began to use research and words to expose major corruption on Wall Street, and wrote hundreds of articles, published a book, advocated for reform, and played a major part in doing a documentary on the topic. So now, here I am, ten years later, working on another documentary with the brilliant and talented Brittney Guest, this one about the Prison Industrial Complex, running for political office, and helping spearhead an initiative petition to allow the people of OKC to vote on not spending people to jail or prison for simple marijuana possession. And wanting to start painting again “in my spare time”. My activism consumes a LOT of my time, and causes me to neglect some of the traditional things that supposedly get candidates elected. It makes me wonder….does it really come down to who knocks the most doors, who raises (and spends) the most money, who sends out the most flyers with pictures of your kids on them? It is really about corporations, and political careers, and going to the right functions and saying the right things? Or is there room for an ACTIVIST in Oklahoma politics, someone who DOES instead of promises, someone who cares about people over money, who values compassion more than just shaking hands? Don’t get me wrong, I will knock doors, but I’ll do it with a purpose, I’ll do it as an activist, with a petition in my hands. I mentioned on the radio recently that I hope that someday ALL candidates for office are activists instead of politicians. And that’s true. I hope I can prove that DOING instead of simply talking is what really matters, and that heart counts more than money. I want to win to start a NEW MOVEMENT OF THE PEOPLE in Oklahoma. I want to win so that 15 other populist/activists run for office, and so that they believe that THEY can win. And that eventually, we will have a legislature filled with people who are there for the people, ALL of the people, and NOT for corporate or personal political gain. Someday, Oklahoma will be run by activists instead of politicians. And things will finally change for the better. For all of us, for those oppressed, imprisoned, marginalized, abused, and desperate just to have a fulfilling, happy life. For those who just want to earn a living for their hard work, and who want to have the freedom to love who they want, and believe what they want. To be who they want. Then, and only then, will Oklahoma shake off the culture of greed that has poisoned our political system, and embrace the populist values of our state’s history.